What if the land has an unpaid mortgage but the bank went out of business? Reader Question: Hi, I’m trying to buy a piece of land from a private owner. Apparently he got the property at auction several years ago. My title company found an unsatisfied mortgage from 27 years ago. It seems that the company that held the loan had gone out of business. No information can be found on this company or any company that may have assumed their loans. The title company will not issue a policy on this property. How can this be resolved? Should I run or is there a way to do this? The seller wants to make a contract saying he will assume responsibility if ever a problem should arise. I’m not so sure about this. What do you think? Rob. Monty’s Answer: Hello Rob, thanks for asking the question. My advice is to seek legal advice from an experienced real estate attorney, not associated with the title company before deciding which way to go. Each state has different regulations and laws. The attorney should be practicing in the location of the land. While you are correct to see a red flag waving, it may be that the issue can be resolved. 27 years were not that long ago. The amount of the mortgage would impact the accrued interest for those years. What is the amount of the total debt? A good real estate attorney can advise of the risks in proceeding, or not. Before I sought out the lawyer, do some legwork to get more information to prepare for them. I would also consider a second opinion from a independent title company. I would look at the recorded mortgage that is causing the trouble to discover the drafter’s name or who witnessed it. If a link can be found to a title company on the mortgage document, that company may be a good option to ask for the second opinion. It seems highly unusual to me that a company would just walk away from a mortgage without a trace. Perhaps the previous owner satisfied the loan and never recorded the satisfaction. 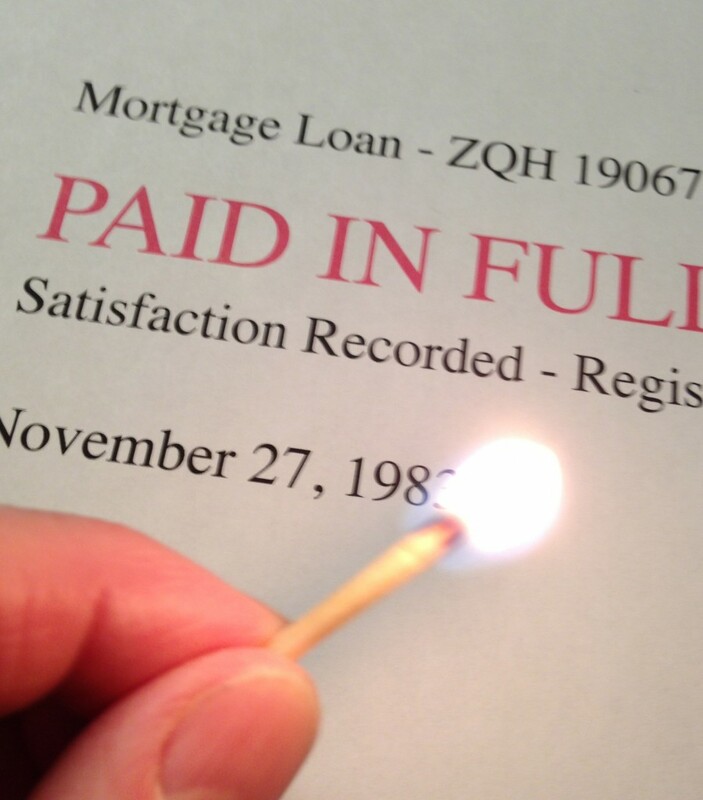 It is common for the satisfaction to be stamped or written on the face of the original mortgage contract. The satisfaction may be tucked away in a storage file in a basement somewhere. Another possibility is the satisfaction was misfiled at the courthouse. This is a good example of having another set of eyeballs take a look. While it is highly congenial for the seller to offer to guarantee the loan if the lender ever surfaces, I question whether your attorney would sign off on that proposition. Has the seller made any efforts to track down the satisfaction document? Would the seller agree to foot your attorney’s fees? This is an issue that has to be solved now, or someday when the next owner attempts to sell it; they may find themselves in the same boat as the current owner. The fact the buyer bought property at auction does not mean the buyer should not have received clear title. Was a title company involved at that time? Does the current owner have recourse in his documents from the auction? Did the auction house comply with all the state requirements? Did the auction house also sell off the personal property? The satisfaction may be among the articles auctioned off that same day. Depending on your rapport with the seller, offer to do the legwork, but if successful in finding the solution, to be paid for your time. This may be the reason the title company is bowing out. They see it may take many hours of footwork trying to resolve this cloud on the title with no guarantee of success. This situation is an example of the types of problems real estate agents encounter regularly. You and the seller may also consider getting an agent involved. Spending the time and effort it takes to solve this “cold case” may depend on the value of the transaction, the reason to buy it and whether you have the time to spend playing a detective. I hope this information is useful. I will be pleased if you tell me the outcome. Good luck, Rob. Ask me if there are other questions.